With their aim to rescue discarded motorcycle parts from rusting away in the landfill, folks at ClassifiedMoto love transforming the same into all kinds of moto-inspired art. While at times they would create a floor lamp out of the trashed bike parts, occasionally they morph those outmoded scrap items into a table. Priced at $229-1499, each recycled home furniture and lighting item would sure add a green nuance to your home décor. Created from vintage Japanese motorcycle bits, this floor lamp uses a brake rotor and transmission gear as its stand and a spring and shock as its top. Two brushed chrome fork tubes are responsible to allow it a decent height, i.e. 64 inches. Since the lamp owes its creation to recycled motorbike parts, you can see some dents or scratches here and there. Made from discarded components from up to three different vintage motorcycles, the Vintage Motorcycle Lamp utilizes a spring, shock absorber, brake rotor and transmission gear. All components are welded together to bring the lamp into existence. Standing tall at an average around 18 inches, the Vintage Motorcycle Lamp flaunts a base measuring between 11 and 12 inches across. Originally created for a tattoo studio in Maryland, the Café’ Table is now up for sale. 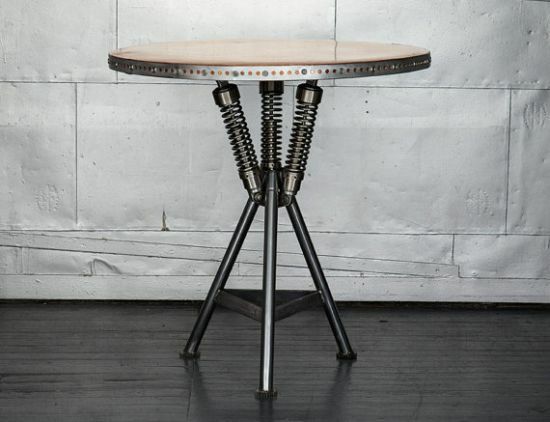 Built from recycled Japanese bike parts, the 36 inches high and approx 34 inches in diameter table touts a wooden top, which is further covered in brushed copper and finished with punched steel bezel. The table’s legs are made from brushed chrome fork tubes, which further support three springs and shock absorbers. The table further has transmission gears for its feet. Finally yet importantly, the Classified Moto Camshaft Lamp offers a novel spin on vintage parts lighting. Made from a discarded brake rotor and a vintage Japanese camshaft, the simple lamp would sure allow you show your geeky side to the world.